Sometimes I like to poke around in the files of the games I bought on Steam, just for fun or maybe to listen to the game music. Most game engines put the game files in their own proprietary archive files, so I started to reverse engineer those formats, at least to the point where I could extract the files. Some game archive file formats proved to be so simple that I was able to easily write the archives, too. So I thought I write down how I did it, maybe someone else finds this useful? 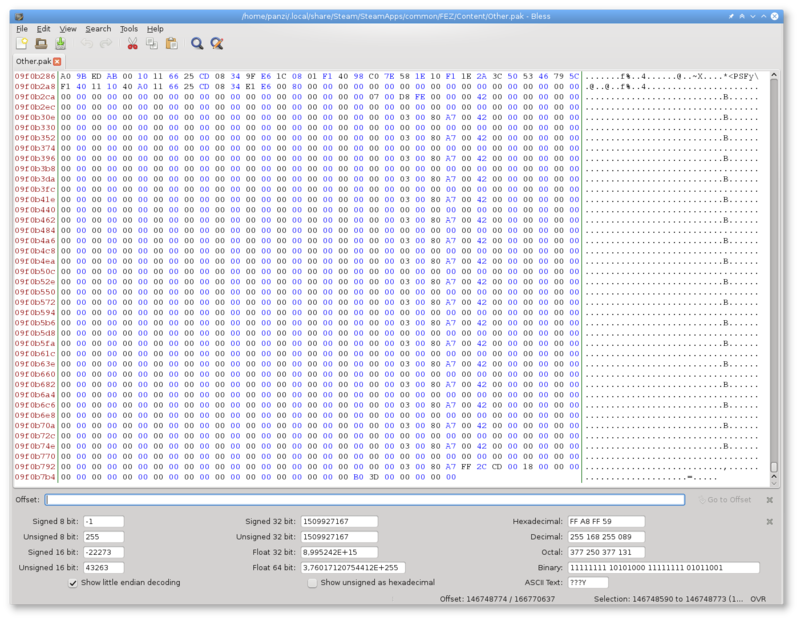 The main tools I use are a hex editor (bless) and Python. I would like those fields in the status bar to be text fields that I can edit, making it easy to select a certain area of the file when I know the size in bytes. 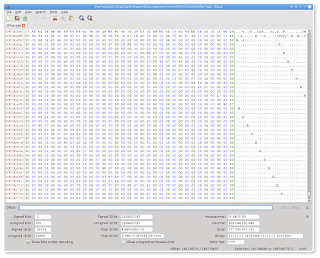 If anyone knows a (Linux) hex editor that does that let me know! 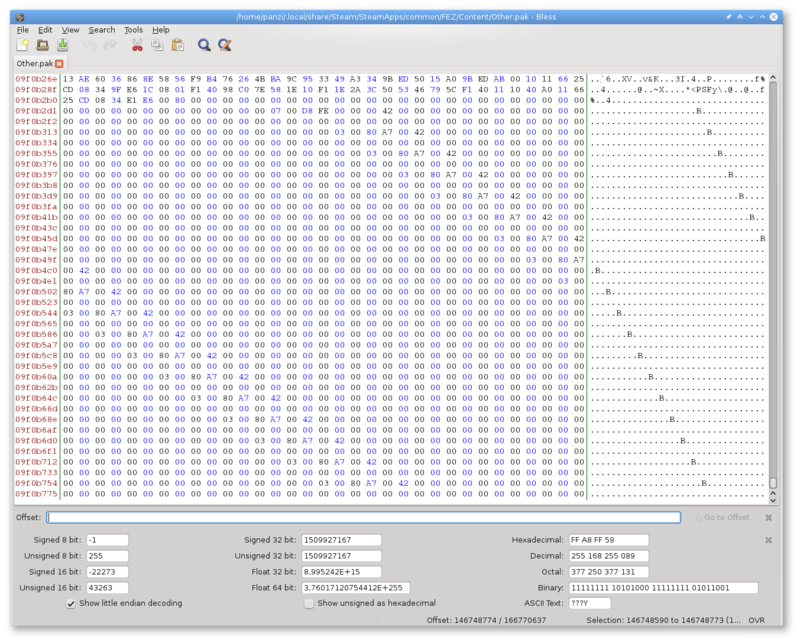 So there are 5 bytes that aren't printable ASCII character and then there is a bit of ASCII. 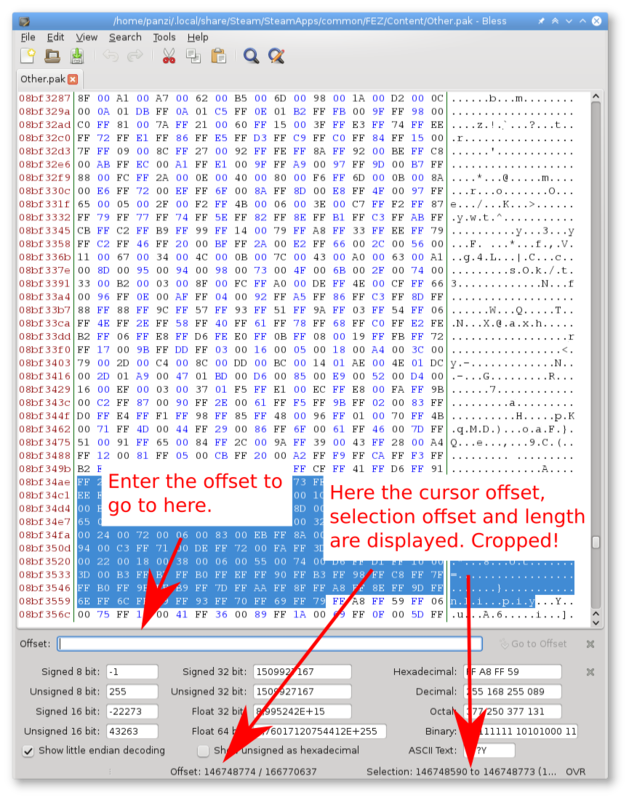 Those first bytes don't look like a file signature/magic, so I guess it's already data. But denoting what and how? For the how: Most CPU architectures today are little-endian, Windows certainly only runs on little-endian systems (ignoring the XBox 360). Little- and big-endian are ways to encode integers in memory. It's the order of the bytes that make up the number. A 32bit integer consists of 4 bytes. For little-endian the least significant byte comes first, for big endian it's the other way around. Almost everyone has strong opinions about which encoding is the "correct" one, but let's not go into that. As a first assumption (which I never had to overthrow so far) let's assume integers are stored in little-endian encoding. 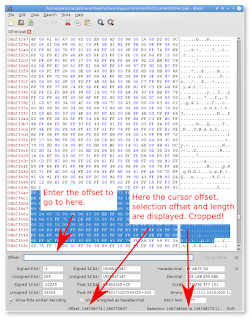 As a further assumption lets say that sizes of embedded files and things like file counts are stored as unsigned 32 bit values. Only if the game files would exceed 4 GB (or 2 GB for signed values) one would need 64 bit integers. 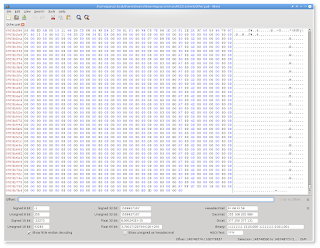 So let's interpret the first 4 bytes as an unsigned 32 bit integer, what do we get? 215 That's a low enough number that it might be a file count. Let's run with that. But it's 5 bytes that are non-ASCII, what is the next one? Well, file names usually are quite short, so maybe they are limited to 255 characters in FEZ? Then we get 24 followed by 24 bytes of printable ASCII characters ("other textures\fullwhite") and then more non-ASCII bytes. So that seems right. How many non-ASCII bytes? 4! As 32 bit integer it's the number 203. A file size? Maybe the next 203 bytes are the file data? Indeed it works to read the file like that (1 byte file name length, file name, 4 bytes file data length, file data, repeat). That was easy! With this knowledge I wrote a small Python program that can list, unpack, pack and even read-only mount FEZ game archives. See fezpak on GitHub. Next time I'll talk about a more complicated file format, which I reverse engineered in order to make a simple sprite swap game mod.